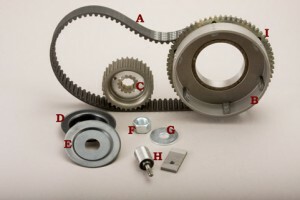 47-31 SE-5 | Belt Drives, LTD.
Our 11mm belt drives have been a mainstay from our early years. Both young and old belt drive enthusiasts still trust that the 11mm kits are the best all around performing belt drive kits out there for riding, durability and function. Retain your stock clutch hub and clutch plates. Just fit them into our belt drive rear pulley basket, use our front belt pulley and belt and away you go!. You can even upgrade your old clutch hub and plates using our optional CC-100-s Competitor Clutch for 30% more clutch surface. Our 47-31 SE-5 fits 1979 – E1984 Shovelhead 5 speed electric start models.